On our recent trip to Derbyshire, we visited the village of Eyam which was very close to where we were staying. 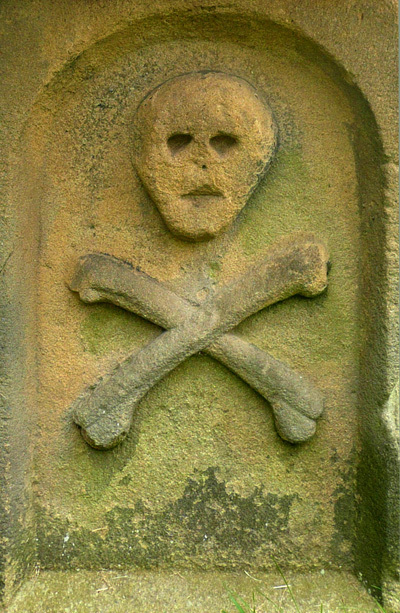 Eyam is known as “the plague village”. In 1665 the village tailor received a parcel from London and it contained some bundles of material and with it plague infected fleas. He was dead within a week. The disease spread rapidly. Some people wished to flee but the rector, the Rev. William Mompesson introduced precautions to slow the spread of the illness, including the arrangement that families were to bury their own dead and the relocation of church services from the church of St Lawrence to outdoors at Cucklett Delph to allow villagers to separate themselves, reducing the risk of infection. The best-known decision was to quarantine the entire village to prevent further spread of the disease. The plague raged in the village for 14 months, taking at least 260 lives. We visited the small yet packed Eyam museum, which was very informative, and well laid out and brought the tragedy that fell upon this village to life very well. 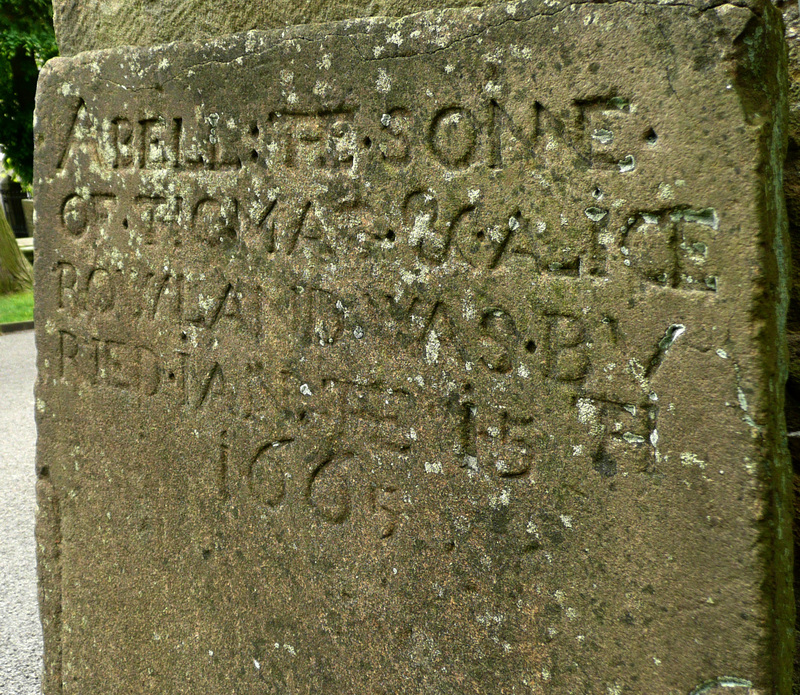 Then we visited the parish church with its rich array of lettering and stone carving. 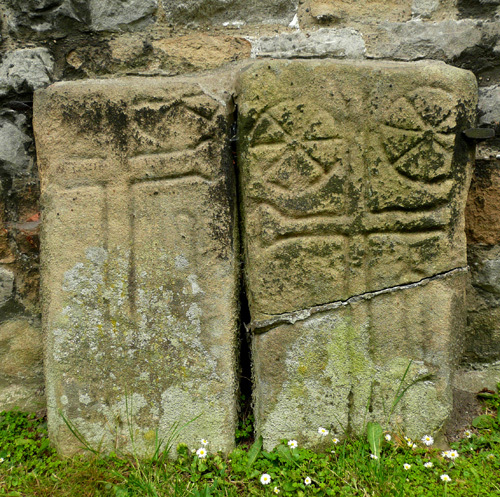 There are some pictures below, including a plague grave from 1665, some wonderfully bold stone carvings taken from tombs and also some images of the Saxon Cross in the churchyard, of which Pevsner says : “notable for the survival of the head, coarse vine scrolls and interlace on the shaft, of which unfortunately the top two feet or so are missing. The date is probably early 9th Century”. it is well worth a look at the rich abundance of “ligatures” (the joining of letters) the THE and NN and AL and WA and more TH’s. I think it’s a lovely stone. It seems nicely spaced overall and yet the fact that the word BU – RIED is split onto two lines makes one wonder if it was just carved directly with no preliminary design, despite the strong overall balance of the inscription. 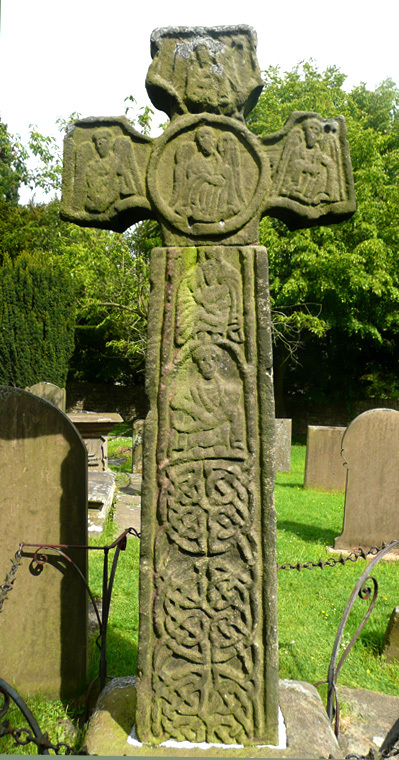 See my flickr pages for more Eyam pictures. 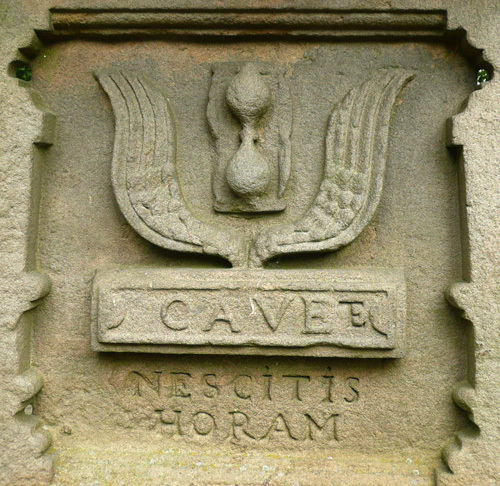 This entry was posted in lettercutting, old memorials, stone carving, typography and tagged Eyam, lettering, Saxon carving, stone carving, stone lettering. Bookmark the permalink.